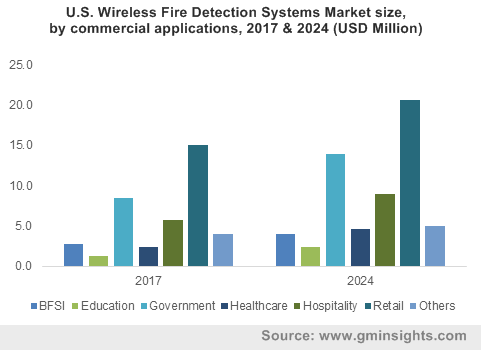 Wireless Fire Detection System Market size was estimated at approximately USD 300 million in 2017 and is predicted to grow at 9% CAGR from 2018 to 2024. Advancements in networking infrastructure and ubiquity of internet penetration across the globe can be attributed as the key growth drivers toward wireless fire detection system market growth over its wired counterparts. The improvement in standards and codes for fire safety has positively impacted the penetration of radio fire alarm system and this factor is expected to propel the industry growth over the forecast period. The growing demand for safety and security given the steep rise in new construction activities has led to advancements in fire detection technology driving the market. These systems offer ease-of-installation, prevent the use of asbestos, and enhance aesthetics by eliminating the need for drilling holes and cabling requirements. The ongoing trend toward integration of multiple devices, Big Data, IoT, and convergence of integrated solutions are expected to drive the adoption of radio fire alarm systems. The components in the wireless fire detection system market include sensors that are capable of transmitting and interacting with the fire alarm panels wirelessly. The segment holds the largest market share of over 50 percent in 2017 and is expected to grow at the fastest pace over the forecast period owing to the enhanced features offered by such solutions. Some common features of wireless sensors comprise sensitivity in the small micron range for smoke detection, long battery life, tamper-proof design, LED indicators, audible maintenance warning, and self-diagnostic capabilities. Fire alarm panels in the market are expected to grow at a CAGR of 9 percent from 2018 to 2024. The panels collect information from sensors and identify the event and alarm the same. The events are automatically reported to the central monitoring station and to private telephones via SMS. Other system components include call points that represent the smallest component segment owing to their low price, input-output modules, and other devices including beacons and sounders, flasher banners, control and repeater, installation, and survey equipment, among others. The global wireless fire detection system market is segmented as smoke, heat, gas, and multi-sensor detectors. Smoke detector types include photoelectric, ionization, and dual sensors. Photoelectric smoke detectors are expected to replace the ionization types, which are being phased out by legislation mandating their disposal. The demand for multi-sensor detectors is expected to grow considerably in the market over the future despite their higher ASP due to the benefit of both smoke and heat detection. Price erosion is expected to serve as a major trend for the growth of multi-sensor detector market over the forecast period. The wireless solution offers the ease-of-installation and the time associated with the deployment is also significantly lesser as compared to the traditional wired systems. The rising use of wireless sensors for home automation is also expected to serve as a key driver for the radio fire alarm system market growth over the forecast period. The wireless fire detection system market is bifurcated into fully wireless and hybrid system. The ease-of-integration of radio fire alarm system with hardwired addressable fire detection system through radio loop modules has positivity stimulated the penetration of wireless solutions among end-use markets. This amalgamation of wireless technology with wire systems enhances the reliability and adds to the efficiency of the overall system. Hybrid radio fire alarm systems offer ease-of-installation in both new buildings and retrofitting environments. The system helps to reduce the labor costs associated with system installation. Fully wireless solutions are expected to witness a surge in demand over the forecast period, given the significant benefit of eliminating the need for cabling and wiring different devices, saving over 50 percent of the initial installation cost for end users. Wireless fire detection system market offers improved notification and communication in cases of emergencies with rapid information relay to emergency response teams and local fire department. In addition, the improvements in the existing government regulations and mandates regarding fire protection systems are the major factors driving the industry demand for fully-wireless solutions, which are perceived to be slightly less reliable owing to the need for constant battery management. The growth of the radio fire alarms market can be attributed to the increasing installations of such systems in retrofit applications due to the reduction in the time required for system installation, the cost-effectiveness of the solution, and the ease involved in installing these systems. Retrofit deployments are mainly driven by changes in existing codes and laws that may have been pointed out during an inspection, remodeling of building to the latest fire safety systems, and the need to upgrade as per the norms of insurance carriers. In existing buildings and infrastructures, rewiring the entire building can be extensive. In residential applications, such as multi-occupancy homes or social housings applications, logistics and timing play a vital role in the installation of this technology. The rising trends of smart homes and connected devices are expected to drive demand for radio fire alarm systems across residential applications and render them as the fastest growing application segment. In commercial applications, the demerits of time required in the installation of wired systems, such as a disruption in staff productivity downtime, have alleviated the demand for alternative market that are less intrusive and quicker to install. The industrial sector dominated the global industry and the trend is expected to continue given the rise in retrofitting of industries with the latest safety and security standards to meet the best manufacturing practices requirements. Western Europe is expected to witness a sharp growth of over 12 percent in market owing to favorable infrastructure remodeling trends and stringent conformation to standards, which are expected to drive the demand for technologically-advanced fire security solutions. European countries have exhibited an increased adoption of the technology in the market due to the presence of specialist wireless system manufacturers and the favorable government mandates regarding the installation of smoke detectors in homes in countries including the UK, Germany, and France. 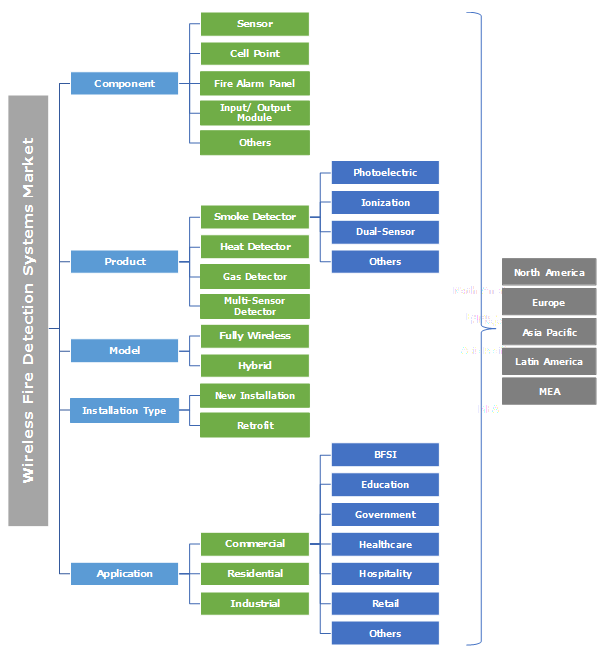 The players in the wireless fire detection system market have adopted various strategies, such as technological innovations, to enhance system reliability, investment in Research & Development (R&D), price differentiation, and acquisitions of specialist radio fire alarm system providers to gain a competitive advantage, For instance, in 2017, Halma PLC acquired Argus Security, an Italian wireless fire safety systems manufacturer, and Sterling Safety Systems, its distributor based in the UK in a move to add wireless solutions under its portfolio of fire detection products and to accelerate the future product development. The declining price of sub-components has helped players in securing a competitive edge by providing radio fire alarm system at competitive prices. Key players in the wireless fire detection system industry include Electro Detectors Ltd., Siemens AG, EMS Wireless Fire and Security Ltd., EuroFyre Ltd., Sterling Safety Systems, Honeywell International, Inc., Halma PLC, Tyco International PLC, HOCHIKI Corporation, (UK), Robert Bosch GmbH, and Detectomat GmbH, among others. Key benefits of the market include the cost of ownership reductions, easy installation, less commissioning, and sustainability of the solution. However, the reliability of the system and signal interference may pose a threat to the viability of radio fire alarm system in diverse environments. The market is characterized by market player’s strategy toward the horizontal integration and acquisition of wireless technology system providers to enhance the capabilities of their existing fire detection solution. For instance, DEF Network acquired Detectomat in May 2017 and Johnson Controls acquired Tyco International in September 2016. The growing demand from end users to install the most advanced fire protection system along with minimal installation time and complications is expected to drive the adoption of radio fire alarm systems across industry verticals. Other factors driving market growth include ease in the protection of temporary structures such as events and exhibitions, the demand for connected and integrated fire safety systems, and the elimination of cabling, leading to minimal alterations to the building’s aesthetics.